2.2 Second Video: "15-6-17 .v2"
2.4 Fourth Video "LAST WARNING"
2.5 Fifth Video: "ARE YOU READY?" Banojxot Xuh was a YouTube ARG that was posted to several country-themed subreddits, and appeared to have a strong political focus. 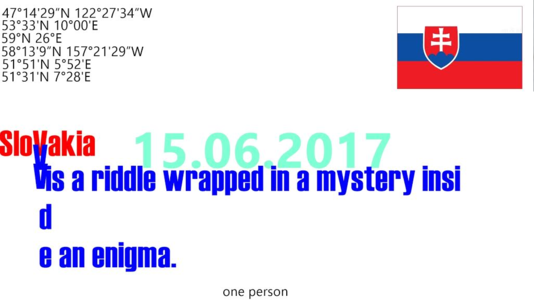 It contained many codes hidden throughout the videos and references to Slovakia along with a strong focus on the date June 15th, 2017. Originally, the video was posted in the England Subreddit but the user was banned, the post and the video deleted. Then, on May 13th, an image was posted in the Slovakian Subreddit by an user called /u/Banojxot (same as the YT channel) featuring a QR code that leads to a video with the words "Get Ready" in red and the date 15.6.17, or June 15th, 2017. Later, on May 18th, the user /u/Hamburger__96 posted a photo of a sort of flyer featuring the same image posted in r/Slovakia and the number 0023 handwritten in the back in the Germany subreddit. It is speculated that /u/Hamburger__96 was the same person behind the Banojxot account on Reddit, although this is still unclear. 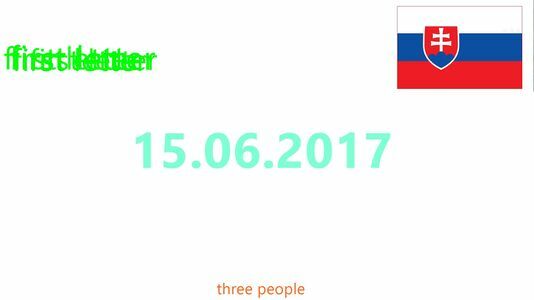 On May 13th a YouTube video was uploaded by Banojxot Xuh called 15-6-17. The video had the tags of, scoddD, c432.657.33., 16.6294.22.30, 177.947.29.0, be, C A R E F U L, the-y, are, read-y, and Y.y. Text stacked goes, 3: blue, no serifs 3: blue, serifs 5: blue, serifs 7: orange, serifs 4: red, serifs. The person/s has yet to be identified. The code, TIUINI TIUINIJIKIXI QIMI TINI WIRIJIOIQINI has a possible solution, by taking the numbers from 0:31 in the order 5-4-3-3-7, the text returned, NIMNO, a small settlement in Slovenia. The code, Yklw lw mzwy ykh ehjlrrlrj translates to This is just the beginning using a substitution cipher. The string of yellow text that uses a Polybius Square then a substitution to translate to, Please email me and I will give more information.. The code, TSFSPMZYESADUGE is ROT8 that translates to, BANAXUHGMAILCOM. The code, WPSZEOME MW TSMRX is ROT22 that translates to, SLOVAKIA IS POINT. A set of coordinates for locations emphasizing a Slovakian connection. The background image is a picture from this book with the quote of, Desolate be Tara for ever and ever!. This is a story from Ireland, on how a hill, Tara, was unremarkable, yet magic. It was a pagan monument to crown the king. In 558 A.D. a saint dispelled Tara of its function as a pagan place of worship, and brought Christianity to Ireland. However, the places located at these coordinates aren't very remarkable. A set of coordinates that point to Slovakia background is a picture from this book with the quote of, Desolate be Tara for ever and ever!. Red text saying "contact me." An upside down and backwards picture of Slovakia. 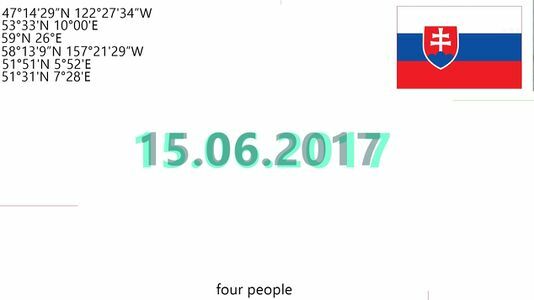 A second video was uploaded on the 21st of May, called 15-6-17.v2. The tags of the video are, 383, slovakia, poland, germany, and 0.23451.734. Code, Ju xjmm ibqqfo bhbjo is ROT25 and translates to, It will happen again. Text, 15.6.17 stacked on top of itself 3 times. An image flashed, brightened to show color. Blue text that reads, Yesterday is history, tomorrow is a mystery, today is God's gift, that's why we call it the present., a quote from Bill Keane. A video of a dollar bill is shown. An image is flashed, brightened to show color. A Slovakian and Polish flag are shown, along with a burning US $1 bill. Code, Lmv slfi droo xszmtv vevibgsrmt is an atbash cipher that translates to, One hour will change everything. A third and final flashed image, brightened to show color. Blue text that reads, The ultimate mystery is tomorrow. Blue text that reads, Black and white is abstract; color is not. Looking at a black and white photograph you are already looking at a strange world, a line from American Prospects: Photographs by Joel Sternfield, and has a 10 euro bill in the background. Red text that reads, 51°50'45"N 16°34'56"E, coordinates that point near a Intermax. PHU. Eksport, import in Poland. Green text that reads, I hope you know what you are doing. Red text that reads, 15.06.2017. A third video was uploaded on May 24th, 2017. In the video you can find 3 flashes of QR Codes, nearly all of which are the same. All but one would redirect to Banojxot's Youtube or Twitter, and the other one lead to a page in which it showed an image similar to the images sent in emails. This video contains footage of Nice truck attack in France, Kabul bombing attack, and truck attack in Berlin, Germany Christmas market. It also contains text reading "ONE DAY WILL CHANGE EVERYTHING". 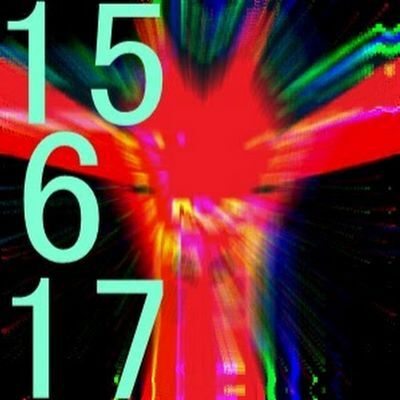 15.6.17, and "BE READY". It also contains a picture of the Serbian flag. Fifth Video: "ARE YOU READY?" This video, posted on June 12th, 2017, consists primarily of footage of Canadian Geese flying. During the early part of the 0:07 second video, an equation is shown superimposed over footage of a human hand. The audio of the video turned out to be a spectrogram, revealing a bit.ly link. The bit.ly link leads to this zippyshare page, which contains a single image of several, numbered people around a van with certain parts highlighted in red. In the upper right is the text "x8x." 1. An alley in Tacoma, Washington. 2. In the middle of Hamburg, Germany in what looks like a massive shopping mall. 3. Just south of Metsla, Estonia. 5. In the Waal river, Central Nijmegen, Netherlands. 6. Centre Dortmund, Germany. Another shopping centre by the looks of it. Has blue and red text that reads, SloVakia is a riddle wrapped in a mystery inside an enigma. This is part of a quote from Winston Churchill: "I cannot forecast to you the action of Russia. It is a riddle, wrapped in a mystery, inside an enigma; but perhaps there is a key. That key is Russian national interest." The emphasised V might point towards the "V for Victory" handsign Churchill was known for. The text on the bottom says one person in black on the bottom. Has the text two people in black on the bottom. The green text seems to resemble, first letter stacked a few times. Bottom text in orange says, three people. Bottom text in black says, four people. 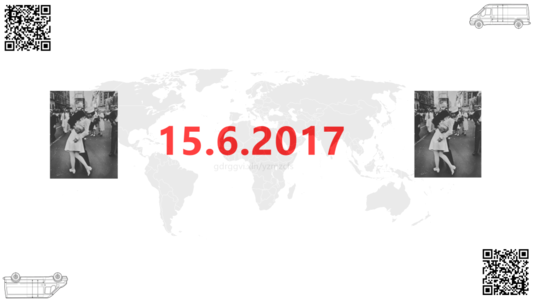 Also the 15.06.2017 is gray with a low opacity layer blue version on top. Has text in grey that reads, People are just numbers, but sometimes they lead to sole the riddle.. Also has five people in black on the bottom and a blue line coming from under the Slovakian flag. Has part of the date cut off, a white line through the flag, and has six people written on the bottom in black. Yellow text reads, no object is mysterious, the mystery is your mind, a wrongly quoted proverb that means that any misunderstanding you might have in looking at something is because of you, not it. Black text on the bottom reads, seven people, the text has a yellow back to it, and a blue line comes up from left of the seven people text. The QR code leads to the Banojxot Xuh Youtube Channel. The picture references V-J Day in Times Square. The vehicle is a Ford Transit (2005). The reference might point towards a certain terror attack by the IRA where a white Ford Transit was used as a mortar platform. The e-mails show us this twitter account through an atbash cipher in Email #8. 1:10 PM - 21 May 2017 You aren't here by accident~B Introduction to Twitter. Location 3: Steinstraße, close to the St. James Church, Hamburg, Germany. 1:19 PM - 21 May 2017 9ce09f56373a96112527aebe5af12f632bd8f0c40132dd76801ad3437e6fdb42 ~B A hash that has yet to be decrypted. 1:23 PM - 22 May 2017 Qt ake huyv frqg, ake wyl huyv uduhafrqls ~B A substitution cipher that reads, If you read this you can read everything. 1:26 PM - 22 May 2017 15.6.2017, soon! 1:11 PM - 29 May 2017 Normal is an ilusion. What's normal for the spider is chaos for the fly. 1:55 PM - 31 May 2017 Now, personally, I like a car with some sort of c h a r a c t e r.
3:37 AM - 4 Jun 2017 I know of no time in human history where ignorance was better than knowledge. 10:52 AM - 6 Jun 2017 In a dark time, the eye begins to see. This page was last edited on 25 July 2018, at 20:59.